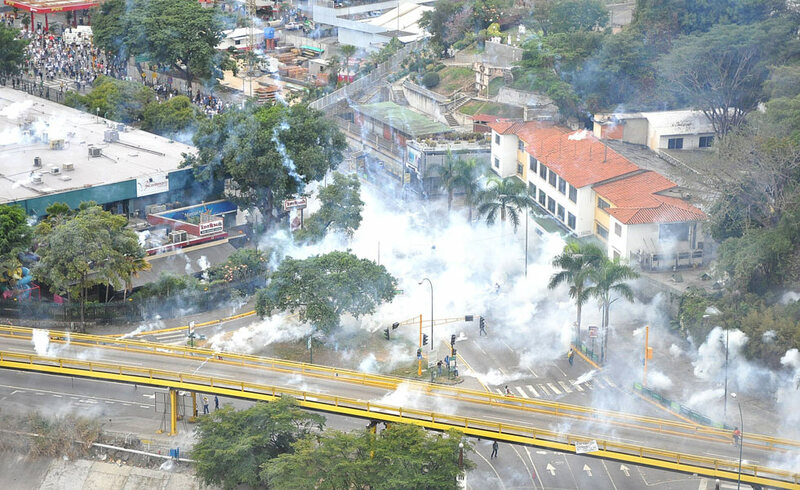 It was a very intense and confusing day in Venezuela today. It all started with Vielma Mora’s statements, which likely threw a curve ball at Nicolas, who can barely handle a softball. While many were wary of Vielma’s statements or confessions, who cares? The importance of Vielma’s statements is not that he may become the leader of any force, but that it throws a monkey wrench into Nicolas’ dream world. A shaky Maduro now has to face internal dissent, when he can barely manage his own faithful groups. He still said “I assume my words one by one“. i.e., no censorship, no repression, no overflights, no Leopoldo in jail, even if he “loves” the revolution. Jeez, if he loves it so much, why is it so imperfect? Why not just blast it and be done with it? And as Maduro met with motorcycle drivers, the wrong image, even if they were not part of the same armed groups terrorizing Venezuela today, you have to wonder what goes through Nicolas’ clearly feeble mind. He should have never left his bus driving position. -The Venezuelan Supreme Court is full of Justices who are alternates. In order to name full time members of the Supreme Court, you need 2/3 of the Deputies of the National Assembly to approve them, something Maduro wants to avoid. -The same is true of the members of the Electoral Board, whose terms expired in April of last year. The Government has made no move to elect them. -And the Comptroller died two yeras ago and has yet to be replaced. Another position that requires 2/3 majority. So much for a Mandela style or Ghandi-like posture, Capriles finally seems mad. And he should be. And he should not call for a “truth” commission, unless Maduro has some form of gesture, like releasing Leopoldo Lopez or Simonovis, or all of the above. Or Maduro could resign too…Given the deaths, the repression, the human rights violations, that is what Maduro should really do. He will have to soon anyway. In fact, Capriles (can’t find the quote) suggested that Maduro had committed genocide, not easy words to pronounce when you are talking about a President. But with twelve deaths form the depression so far and over 600 detained, that is exactly what is going on in Venezuela. Because Art. 53 of the Venezuelan Constitution says anyone can gather publicly with anyone without permission. And Art. 49 says every person has the right to be judged by his natural judges, but Leopoldo is in a military prison, where he was charged. And the same Art. 49 says that every person has the right to know why he is being charged, have access to the evidence and time to prepare a defense. None of this is being followed in Venezuela with the protesters. And on top of that they are being killed (twelve so far) injured and repressed violently, without Maduro even showing that he knows what is going on in the country he presides over. And to top it all off, Maduro declares Thursday Feb. 27th. and Friday Feb. 28th. to be holidays, so that Venezuelans will have six days off in a row, since next week are the Carnival holidays. Clearly Maduro does not want to offer peace, he is hoping protests will go away. But like Valentine’s day, when the same strategy backfired, he may be surprised again. In fact, people are as militant as ever today. What did Vielma know that he said what he said? Why did Capriles become aggressive all of a sudden? I don’t know, but when two such dissimilar political figures act the same way, something is afoot. Some crack in the facade is showing. Some weakness is being perceived and they both want to take advantage of it. Remember, if Maduro resigns, the Constitutional way out of it is elections within a month and both sides seem to be jockeying for position in that race. This entry was posted on	February 24, 2014 at 11:31 pm	and is filed under Uncategorized. Thank you for every other informative site. Where else may just I get that kind of info written in such a perfect way? After much thought, I have concluded that Cuba should apply for statehood under the Venezuelan constitution. That would work out nicely for the vast majority of Cubans and Venezuelans. Imagine having a Venezuelan state that close to Miami! The only people who wouldn’t be happy with this are Raul and Fidel Castro and their sycophants, puppets, and wannabes. ?, “This video has been removed as a violation of….” who exactly YouTube? What is the basis for censorship? Apparently, harassment and bullying on the part of Maduro, et al. is acceptable. Those are the facts we face not only in Venezuela but also in the world. But tghis is nothing compared with the transformation experienced by Noticiero Digital. Anyway, the beasts were properly identified like that GNB. I just hope the video was online one enough for a lot of people to have watched. This was not a Peace conference, it was missing the primary members of the opposition. Fedecamaras represents only a very small sector of Venezuelan society. How could there be Peace when violation to human rights continues on the streets? Latest Title: A resolution deploring the violent repression of peaceful demonstrators in Venezuela, calling for full accountability for human rights violations taking place in Venezuela, and supporting the right of the Venezuelan people to the free and peaceful exercise of representative democracy. Latest Major Action: 2/27/2014 Referred to Senate committee. Status: Referred to the Committee on Foreign Relations. A resolution is needed to deplore the infiltration and intervention of a foreign force (Cuba) into the Venezuelan Government and Military. The US and the UN should be building this case from the available evidence. Latest Title: Supporting the people of Venezuela as they protest peacefully for democratic change and calling to end the violence. Latest Major Action: 2/27/2014 Referred to House subcommittee. Status: Referred to the Subcommittee on the Western Hemisphere. for spanish-challenged readers,google does decent translations. Indeed it does, though it may not have all the slang words down. When I want to translate a Spanish language passage on the web for English language readers, I often do a Google translation on it. Not because I can’t do the translation myself, but because it is faster to correct a Google translation than it is to type the translation out myself. This is just window dressing agaist all the outrage from around the world. In two weeks she’ll be walking around as if nothing had happened. I don’t think Maduro is resigning anytime soon, although he may be deposed eventually. It took the tough Ukrainians 3 months, 100 dead, 20 legislators saltando la talanquera to get rid of their despot. Nor do I think Vielma is jockeying for position, but rather he has the hottest potato in his hands, and he has always been a little more middle road/decent than most of his Revolutionary counterparts. As for Capriles, he has become a little less “bolas claras”, as fits his usual political expediency stance…. 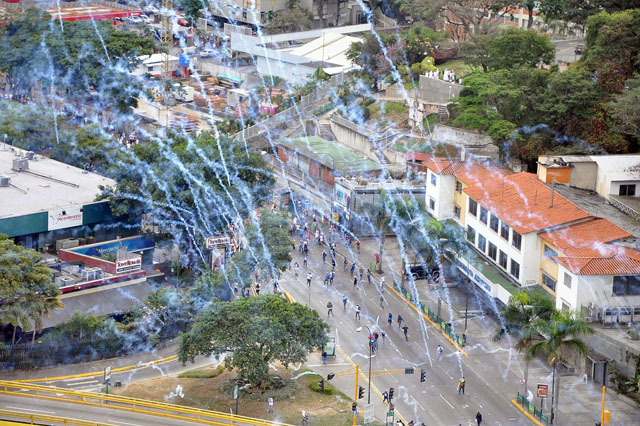 Pictures show the GNB this afternoon, using tear gas canisters to bombard protesters in Las Mercedes main ave. in Caracas, just in front of the Venezuelan American Civic Center. When all you have is a hammer….. I always liked the wall plaque that says “The beatings will continue until morale improves”. OT: This morning, Huber Matos was one of the three chief commanders of the Cuban revolution died in Miami. He was 95 years old. He changed his mind about Fidel seven months into the revolution and spent 20 years in Cuban prison because. I was introduced to him a few years ago by ambassador James Cason. You don’t want Venezuela to follow the path of Cuba and right now it is. Excellent, and very sad, article by Mexican Enrique Krauze reprinted in runrunes. I get the feeling this is another “win” for the Castros. Kerry’s desire for improved relations can only means continued and improved relation with the existing Maduro regime. Problem is that this is not only about the opposition against Maduro and co. but also against most of continental South America, Central America, Russia, China and a few other choice basket cases. Even the Russians are sending gunboats ! If, or when, the economy implodes I have no doubt Venezuela will be propped up as there will be too many external losers. And the Opposition in power might mean an early implosion for one or two of the vulnerable candidates. So it’s full steam ahead for a continued yet reinforced Maduro because that’s what Venezuela’s neighbours need. And continued calls of fraud and the likes will be ignored by all of your allies because the USA does not gain. Sad but that’s the way it is. That’s what happens when a man with a significant criminal record is democratically elected as the leader. Venezuela is on its own. There will be no outside help arriving, not any help that a person who values freedom would want. I’m thinking this might be a good thing. FPG, this is pure silliness. Russia does not have a dog in this fight. They abandoned Cuba long ago, and don’t have any claims on Venezuelan minerals that would be worth any effort. Venezuela “owes” them money for a bunch of second-rate used planes and subs that they foisted off on Hugo. Doubtful they ever expected to be paid full dollar, and they have bigger fish to fry. Venezuela is on it’s own here. Hats off to Marvinia Jimenez. That video shows she fought really hard for her physical integrity all the way to the end. At the 55-second mark she even manages to kick the beast, probably 40 lbs. heavier, and lose her balance. The latest from her sister is that Marvinia is still jailed and now charged with assault on a GNB. Here is how the poor lady looks after her “assault” on the “authority”. I hope we can make her a symbol of not opposition but resistance to tyranny in Venezuela. What a brave woman! Update: Marvinia Jimenez released on bail. It is time to hold a mirror up to the Chavistas. How can an unarmed Marvinia be threatened with a gun, assaulted after being pinned to the ground, and dragged away by her hair and then be charged with assault. The GNB did the assault. Let’s see a public investigation into the actions of the GNB. Marvinia is a tough woman. I hope she talks to media in the coming days. Boy, I wish I could give her a hug. While my pueblo is quiet, what little economic activity there was here has just about dried up. I’m also hearing more and more people commenting that the end of Maduro is near. Interestingly, from the city of Maturin and Punta de Mata, I’ve heard that there are suddendly trucks arriving with all sorts of goodies that have long been in short supply. Amazing how this government can move when it feels its life is threatened. What happened to this woman bothers me, a lot. I just hope she is still alive. The picture shows a GNB soldier holding a gun at Marvinia Alejandra Jimenez, 35, in Valencia, just a moment before being brutally beaten by the female officer of GNB Josnaidy Castillo. I saw all the still photos of this event when they happened but I hadn’t seen the video. This woman needs to spend the next 10 years in prison for assault. This coupled with the GN taking baseball bat swings at the older gentleman decribes exactly how I feel about this government. Maduro & all his crew need to be in a cell as well. I’m not a Rubio fan, but that was a good speech. En el mundo cada día con + fuerza le dicen genocida a Nicolás,hoy van 2 muertos,varios heridos +detenciones!De cual PAZ habla él? I don’t have the full text of Capriles’ speech, but I’d agree with one commenter here. HCR is playing hardball, using the reports from others. Dale duro (por fin) Capriles. Re Vielma Mora: Playing both sides of the street is a good way to hit by traffic from both directions. The mass is in favour of the opposition now. Miguel, thank you for posting the pictures at the top of this post. Although watching 15 years of blatant injustices against the Venezuelan people that do not follow the bolivarian ideology has become somewhat routine, this cruel and sadist assault on that humble seamstress – Marvinia Jimenez – is something I won’t tolerate passively. Like many Venezuelan, I’m located in Northern California, a remote corner of the world relative to Venezuela and I struggle to find means to make a REAL difference other than signing petitions, protesting in front of a Consulate or expecting The Hague to act. But I’ll find a way, sooner or later. The picture link below is missing from the above collage. Let me post it to show accurately the pain and fear of Miss Jimenez was experiencing in those horrible moments of her life. Like many I too was sickened by the actions taken against the girl. There are many haunting scenes but, for me, that one keeps recurring. Does anyone knowiff the girl was released or detained ? According to her sister, she’s still jailed, shaken, lots of black and blues but otherwise in good health. I feel the same way you do Alex, I also have been signing petitions, posting videos on my Facebook page, and talking to anyone who will listen about the crimes against humanity going on in Venezuela. I can watch a fight, like boxing, if both side are equal, but when I see how the GNB handles the students who have sticks and stones, I also want to make a real difference and get involved somehow. For 14 minutes and 16 seconds, Rubio gave the best oration of his political career, speaking largely off the top of his head and with only the barest of notes. Rubio sometimes dripped with sarcasm or simmered with indignation as he made the case to Congress that the United States needs to continue Cuba sanctions and punish Venezuela. I hope he will be the next President of the U.S., someone who can stand up and tell it like it is. Rubio will get the ball rolling to help the struggle in Venezuela. Rubio’s not a guy you want on your side. He’s a lightweight, and a dummy. That was a very good speech, and I have yet to see evidence that Rubio is a dummy. If anything, he has played his cards very well during the last presidential elections. He called Iran an illegitimate government in that speech–surely not the case. He lied about his grandparents Cuba experience. He recently proposed a new program for states to handle welfare and job creation efforts–and within a day, it was laughed at and dismissed, by both parties, as having absolutely no merit. He served in the state legislature for a short time, and his resume and record there are mundane, to say the least. As Senator, he’s done nothing, and is clueless about world affairs. He parrots the Republican line, because he simply doesn’t UNDERSTAND the issues. So, does that mean you disagree with his speech or what? It’s certainly stronger than anything I’ve heard from the heavyweight smart guys on the other side of the aisle. BTW, I’ll have to ‘google’ that Harkins guy to see what he might best be “categorized” as, besides a tool. The takeaway on Harkin is that he’s retiring when his term is over in 2015. I doubt very much he’ll be spending his retirement in Cuba, despite the accolades he gave the island after his last visit. Being Cuban, the media portrays him as some sort of poster boy on the subject, while there are some Midwestern Repubs AND Dems who are just as anti-Castro, but more in tune with their crimes to get effective legislation and action implemented. I do agree with the basic premise of Rubio’s speech, but to me, it was far from brilliant, and I simply think he’s a horrible orator. oh, I dunno, Ira. I thought the oration was rather perfect. Haven’t come across that level of simplification for easy digestion by the idealists of what the Cuban (and by extension, Venezuelan) experiment is really all about. He actually served in the Florida House for 8+ years and was elected Speaker there after 6 years, so to say that “he served in the state legislature for a short time” and that “his resume and record there are mundane” merely serves to show your prejudiced mindset. Full of obvious truths that some on the left just don’t get. His only failing is that he is a Republican & a Tea Party choice. But he sure can give good speech. Today as I watched one of the videos on the internet, where military forces representing Maduro’s Cuba controlled regime were in a white van taunting young Venezuelans and provoking them to use their meager resources. I realized that there is a strategy behind the Maduro/Cuba regime’s actions. It is an horrific strategy that will continue to create division and anger, with an ultimate result. I believe that Maduro/Cuba is counting on the crisis that is approaching Venezuela, a crisis where the survival and ability of Venezuelans to fight will be compromised by hunger and the basic need of survival. Venezuelans need to be clear who the enemy is and what we are fighting for. We are fighting against a foreign enemy, Cuba, who through coercion, ignorance, manipulation and corruption has been able to take control of our country. What we are fighting for is our sovereignty, the right to be Venezuelans and decide our own destiny. I make call upon my Venezuelan brothers and sisters to ensure that independent supply lines are created to feed and maintain the flight for our sovereignty! I ask that all Venezuela make a call to International Organizations to prevent this impending genocide. Everything is correct, except the last line. The “International Organizations” don’t care. Don’t trust me, think. See Syria, circa TODAY! It appears that Venezuela and US are mirrors where the leaders throw out the rule books and wing it in a reactionary manner. Venezuela is lucky that Mad man doesn’t have drones to use on his citizens !! S.
They have drones, they are called Guardia NAZIonal. Drones=obey without thinking. Surprised at the regimes verbatim translation of Jay Carney’s words… usually they censor that! He did, but the tone seemed too detached from the reality on the ground, ie the extreme violence displayed by government forces and clients. (2) I spent many years thinking about tactics in similar situations (albeit not in Venezuela). I don’t know what you and others might think about this, but it seems to me that the chavista Gov. of Tachira, in so far as he is uncomfortable in his role as it is evolving (be it due to moral or opportunistic reasons), likely will not be alone. It is my impression that many in chavismo, most especially professionals, including functionaries in various ministeries, have stayed in their posts for both pragmatic career reasons, but also because they have not been comfortable with the oppositon they have seen, especially the opposition they saw some years ago. These chavista functionaries are clearly not at all proud or optimistic about the performance and mentality of the present leadership of the central state and the PSUV. They are frankly sarcastic and embarrassed about Maduro and/or Cabello. As the opposition (or certain sections of it) now finally begin to illustrate that a significant percentage of “the street” is with the opposition, it will be ideologically and, in the eyes of these unenthusiastic chavistas, also morally much easier for them to go over and ally with the opposition, or at least break with the present leadership of chavismo while remaining within some newly defined chavismo that is willing to abandon demonization and extreme polarization, and deal with the opposition. This may be another advantage of the turn in tactics that Leopoldo L. has forced upon the opposition with the aid of the militant Venezuelan youth: If the opposition can demonstrate that a significant section of the street (and not only middle class street) is with the opposition, and is willing to go to the street often and take the heat this involves to reveal the undemocratic and repressive nature of Marurismo, then, finally, the possibility of cracking the ranks of chavismo will start to be possible. This is the kind of opposition that many chavistas, now sitting uncomfortably on the fence, could accept or align with. It seems to me that, ultimately, the opposition cannot prevail without such defections. Yesterday was a particularly heavy day of emails, threats, tweeter wars in which were telling me it is all the US behind and I am paid, etc, the usual PSF stuff that I had not seen in a long time. There was also a threat telling me I am a paid CIA agent and a couple of attempts by one of the two people who is banned from this blog to post comments telling me about the right wing war against Venezuela. They must be angry that you don’t share those CIA dollars. Still no concrete evidence of any CIA agent anywhere, just the usual it’s all the gringos fault crap that Chavez and Castro were always so fond of. Just the usual reflexive, repetitious propaganda. its quite interesting the belief that people have, its like.. CIA is running everything all the time… i read a whole slew of those wikileaks documents, i am a proponent of allowing these files to be in public, it allows us the public to judge our governments action, and last i read, it didn’t seem like the US was intervening at all in venezuela, albeit they are aware of what is going on, but it doesnt mean they are actively looking to make changes forcefully… another thing is, it seems these groups against right wing agendas dont understand is that for the states, as long as Venezuela is still selling us oil, i dont think USA would do anything to change the status quo… which is what i dont see why these groups dont see that…. i was at a chicago protest last saturday, across the streets were these communist lovers, all thinking the CIA is involved in all this… its astonishing to see how these people believe in such things… dont get me wrong, i know CIA were involved back in the 70s, 80s, but to say for sure that they are actively doing that with Obama in power, I mean… I can say they are informed… but to say actively trying to break the venezuelan government, is just hog wash… id imagine if anything the US know that they will fall on their own… and they are just waiting for the eventual fall.. The analysis is great, as a Venezuelan abroad I am thankful for your reporting of the Venezuelan protests. This said, I would like to nit-pick at something stated in the article: that the president (or the government) are committing genocide. The term ‘genocide’ has a very specific meaning, defined in the 1946 Convention on the Prevention and Suppression of the Crime of Genocide. It is one of the enumerated acts in the convention (ie, murder, grievous bodily harm etc) committed with the ‘intention to destroy in whole or in part a national, ethnical, religious or racial group as such’. ‘Genocide’ is not a catch-all term for widespread human rights violations. To put things in context: genocide occurred in Rwanda in 1994, where the hutu majority wanted to exterminate the tutsi minority in the country: ie, eliminate the whole tutsi population of Rwanda. While it is true that the government is targeting the opposition, it is a far stretch to say that it is doing so with the intention to destroy the group in whole or in part. In any event, the ‘opposition’ does not fit any of the described groups protected by the Convention such that even intentional targeting of the opposition fails to meet the required elements of genocide. So it is absolutely unhelpful to describe what is happening in Venezuela as genocide: it is plainly not. To call the Venezuelan government’s actions a genocide dilutes the meaning of this term, dilutes the seriousness of this crime and is offensive to those who were, in fact, victims of a genocide. Words are important, and it is thus important that we use them correctly. Human rights violations, most certainly yes. Genocide, most definitely not. I agree he exagerated but the Academia Real de La Lengua includes political reasons in the definition of genocide. While it is a stretch to say that is what is happening, if Maduro does not backtrack, it may become so. If the regime is able to completely isolate the country as in the case of Cambodia or Rwanda, there may indeed be impetus to genocide. Castro is a cold-blooded communist killer who will live up to communism’s history of mass murder and it is clear that the average Chavista hates the opposition enough to kill people from the photos we have seen so far. It is imperative to keep the news and photos flowing out of the country so that the liars can be exposed. The Golingers, the Oliver Stones, the Glover/Belafonte hot kissers, and the rest will try to cover up what is happening by accusing the US of subversion when no evidence has yet been presented. To be realistic, it is not genocide YET. I agree, I have no idea what Capriles was thinking to talk of genocide (and he kept repeating it!). To have more credibility than the government, you have to present facts as they are, not try to distort reality the other way. Terrible. I do not see a big issue on this inappropriate use of the GENOCIDE wording.. He is beginning to play hard ball, that’s it.. Of course Human right violations are not still genocides but we need to use big words for ordinary people as government officers do. According to some of the proposed definitions, what is happening in Venezuela right now (which hopefully will not escalate) does constitute genocide. It’s genocide because it’s an invading force, Cuba that needs Venezuelan resources, that is causing only Venezuelans to be killed. It is Cuba perpetrating genocide against Venezuela aided and abetted by the Maduro/Cuban Regime. ok, here is the complete program. It is 2 hours long, I don’t have the stomach for it. The Vielma interview starts halfway through.